Get to know your guinea pig’s digestive system, nutritional concerns and how to properly feed your adult guinea pig. Guinea pigs are well developed at birth and within a few months are able to eat an adult diet. They are strict herbivores, that eat only plants, and like rabbits, are hind-gut fermentors that practice coprophagy (ingestion of one’s own faeces). Coprophagy may be a source of B vitamins and a means of optimizing protein utilization. However, its precise contribution to the nutritional needs of guinea pigs is not fully known. As hind gut fermentors, guinea pigs digest much of their food in the caecum and colon (large intestine), which are at the end of the digestive tract. The caecum, a large, thin-walled sac located at the junction of the small and large intestine, contains up to 65% of gastrointestinal (GI) contents. Within the caecum, bacteria and protozoa aid digestion of foods taken in by the guinea pig. Fibre is needed for these bacteria and protozoa within the caecum to stay in balance and function properly. Fibre also aids in maintaining normal GI motility or movement. Without fibre, the gastrointestinal tract slows down, resulting in subsequent changes in the caecum pH, fermentation and bacterial population. With time these changes in the intestinal tract environment can lead to indigestion. You can provide this essential fibre by feeding your guinea pig free-choice grass hay. Oxbow recommends feeding unlimited quantities of timothy, orchard or oat hay. Hay also helps prevent boredom by satisfying your guinea pig’s innate desire to chew, which is an important means of dental health maintenance. In addition to hay, Oxbow’s Adult Guinea Pig Food is a high-fibre pelleted diet which contains stabilized vitamin C and is designed to meet the specific nutritional needs of your guinea pig. Guinea pigs are becoming a more valued, loved and cared for pet in the eyes of their owners, and as a result, veterinary care for guinea pigs has increased. Veterinarians seeing guinea pigs are noticing several health problems attributed to nutrition: vitamin C deficiency, gastrointestinal ileus, obesity, enteritis and urolithiasis. Bleeding in the joints or under the skin. Like humans, guinea pigs are unable to produce their own vitamin C and require a dietary source. Daily requirements of vitamin C range from 20-50 mg per kg of body weight. In order to prevent vitamin C deficiency and subsequent scurvy, Oxbow recommends feeding your guinea pig Adult Guinea Pig Food, a pelleted diet containing stabilized vitamin C.
Gastrointestinal ileus (malfunction of the digestive tract due to gut slowdown) is commonly seen in guinea pigs on low-fibre diets. Many times pet owners do not notice the signs associated with gastrointestinal slowdown until it is too late. Decreased appetite, a bloated or tense abdomen, along with lethargy and a decrease in the volume and size of faeces passed are all signs of gastrointestinal ileus. Diets that incorporate high levels of nondigestible fibre in the form of free-choice grass hay promote increased gut motility and thereby prevent this gut slowdown. Oxbow’s Adult Guinea Pig Food is made from high-quality timothy hay that provides the appropriate fibre needed for healthy digestive system function. Obesity in guinea pigs can lead to respiratory, heart and liver disease. Typical guinea pig feeds on the market contain high levels of fat, commonly over 3% and as high as 5%. These feeds contain corn, oats, and other grains that are designed to appeal to the consumer, but raise the starch and energy content of the food. When these high-fat foods are fed freechoice, obesity can occur. Obesity not only leads to the previously mentioned health problems, but can also prevent coprophagy, which is necessary for the maintenance of normal gastrointestinal health. Oxbow’s Adult Guinea Pig Food was designed to prevent obesity by adding sufficient fibre, while at the same time eliminating grains that raise fat content. This combination of high fibre and low fat aids in overall digestion. The minimum fibre level of Oxbow’s Adult Guinea Pig Food is 25% and the maximum is 28%, thus providing a healthy balance of fibre and energy. Enteritis (intestinal inflammation associated with toxin production) is a problem commonly associated with diets that contain high levels of energy (starch and glucose). A low-fibre, high-starch diet promotes gut hypomotility and changes the intestinal pH and microbial population which allows pathogens (bad bacteria) to produce toxins that can be fatal. The guinea pig with enteritis may have soft stools and be hunched and inactive due to increased GI gas production and the resulting abdominal pain. High fibre, low-starch Adult Guinea Pig Food is formulated to prevent enteritis. Urolithiasis (bladder stones) is being seen in more and more guinea pigs. Although many are secondary to urinary tract infections, a certain percentage of stones are caused by an imbalance of calcium and phosphorus in the diet. Grass hay is a forage feed, the natural diet for a wild guinea pig, has a higher calcium to phosphorus ratio. Grains have the inverse relationship and contain more phosphorus than calcium. Research has proven that diets containing an inverse ratio of calcium and phosphorus can cause stones and soft tissue calcifications. Dietary levels of vitamin D and magnesium may also influence the development of bladder stones. Oxbow’s Adult Guinea Pig Food provides the mature guinea pig with the proper calcium to phosphorus ratio and appropriate levels of vitamin D and magnesium. Oxbow Animal Health agrees with nutritionists and veterinarians that less nutrient dense diets are needed to prolong the lives of small mammals, especially guinea pigs and rabbits. Adult Guinea Pig Food is specifically designed to meet the maintenance nutritional needs of the adult guinea pig. 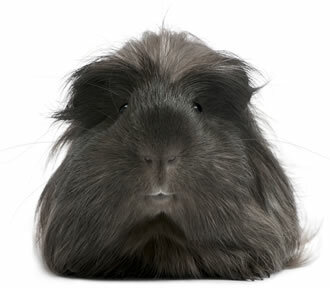 The first ingredient in Adult Guinea Pig Food is timothy hay, which veterinarians recommend for improving the nutritional health of guinea pigs. Timothy hay mirrors the proper calcium to phosphorus ratio found in natural forages, stimulates gastrointestinal motility, and aids in the prevention of obesity. Through the science of nutrition, Oxbow Animal Health wants to provide adult guinea pigs with the opportunity to live longer and healthier lives. Dr. Peter Fisher is owner and director of the Pet Care Veterinary Hospital in Virgina Beach, Virginia. 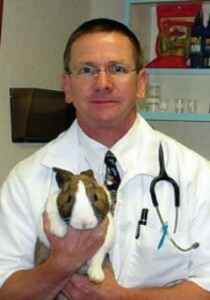 He specialises in the critical care of small mammal exotics. Hillyer, EV, KE Quesenberry, and TM Donnelly. “Biology, husbandry and clinical techniques [guinea pigs and chinchillas].” Ferrets, Rabbits, and Rodents: Clinical Medicine and Surgery. Eds. Quesenberry and Hillyer. Philadelphia: WB Saunders, 1997. 243-59. Kupersmith, D. “A Practical Overview of Small Mammal Nutrition.” Seminars in Avian and Exotic Medicine 7:3, WB Saunders, (1998) 141-47.